Last Friday evening my husband insisted in taking me to a new restaurant he was raving about lately. He usually goes there for business lunch, so every time he came back home after work, he described me all the succulent dishes he ate. Honestly, being the foodie person I am, I was curious and had high expectations about this place. 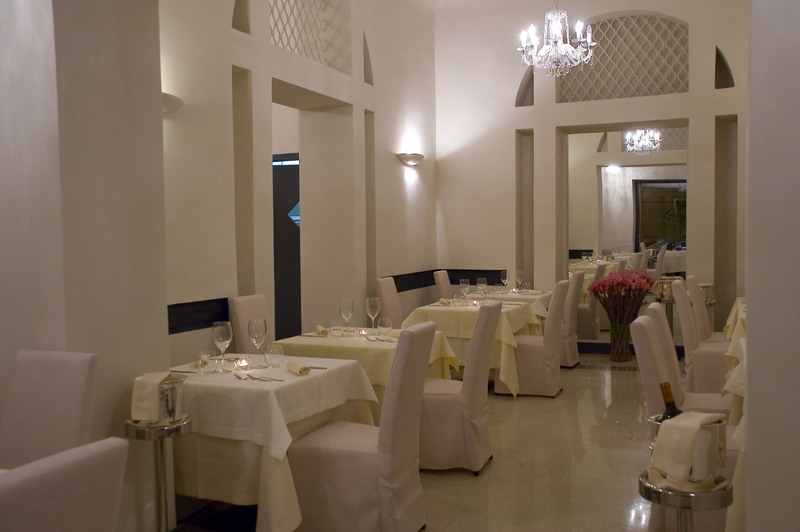 The spot’s name is Larys Restaurant, which is located in a quiet and elegant Roman neighborhood near Villa Borghese on a side street of Via Po. As I entered the place, I noticed the white furnishings and the clean,neat, and modern interiors, and a beautiful red sofa that stand out from the context. Décor-wise the restaurant seemed pretentious, but I knew my husband would never take me to a poncy place. Since we all know that first impressions count, when Mario Monfreda, Larys’ Sommelier, greeted us warmly and made us feel so at ease, it gave me good vibes. While reading the menu, mostly featuring fresh seafood (but also including some meat choices), the background music caught my attention: the music played was the MTV Unplugged CD by the rock band Nirvana. Was this a sign? Will I be able to reach gastronomic Nirvana at Larys? 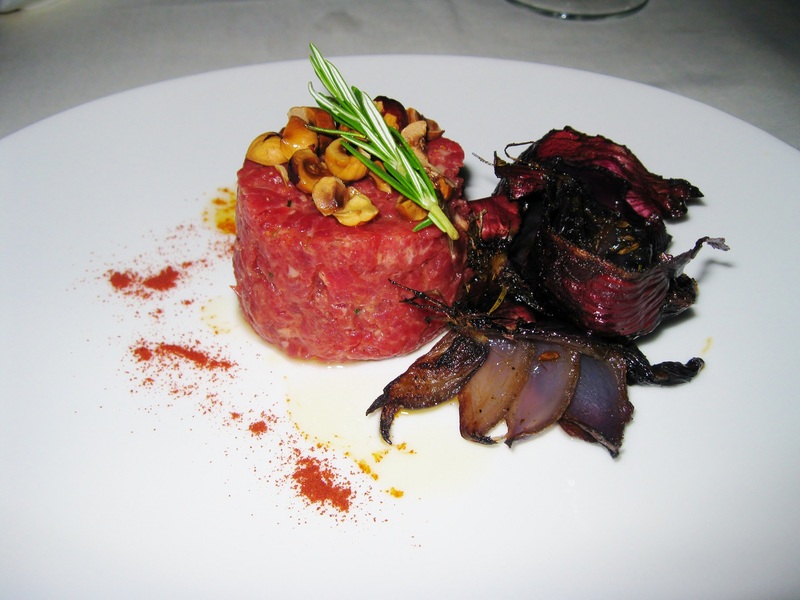 We started with a beef tartare with hazelnut oil and baked shallots. The crunchiness of hazelnuts paired with the sweetness of shallots was totally mind-blowing. 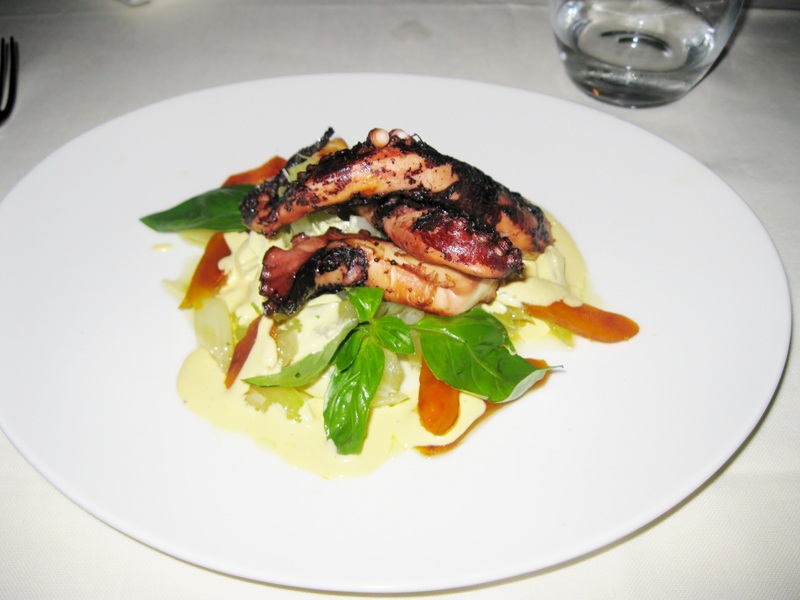 Grilled octopus with celery julienne and bottarga lemon sauce. Bottarga is dry grey mullet roe, which is a fine and precious ingredient in Italy. Bottarga (di muggine) is a typical product of Sicily and Sardinia and it is used in most regional recipes of these islands. After my first bite of this dish, I thought the mixing of ingredients was genius: the smoky flavour of the tender octopus, paired perfectly with the crunchiness and freshness of celery. Even though the sauce was quite difficult for me to describe, it was reminiscent of the dish itself: the smoked flavour of bottarga and the tanginess of fresh lemon. 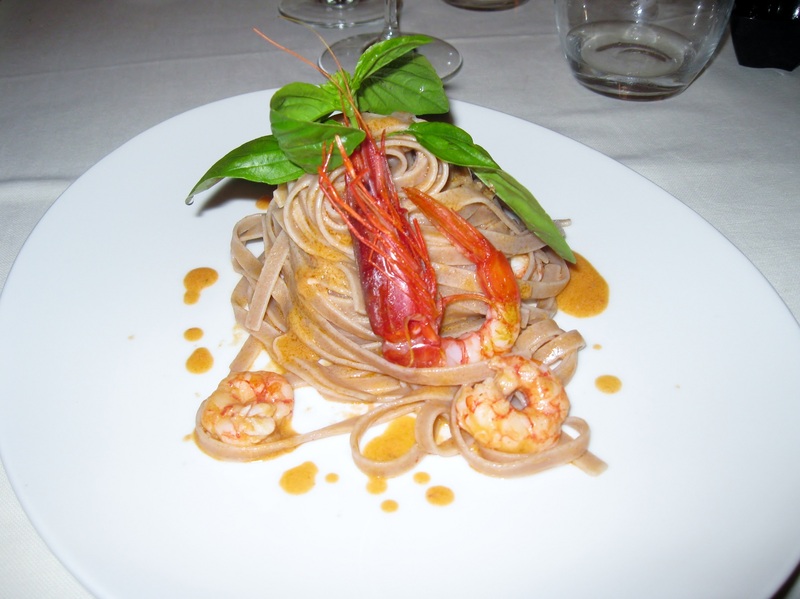 Farro fettuccine with red prawns juice and red prawns. It’s no rocket science but I thought the idea was brilliant and mastered to perfection. 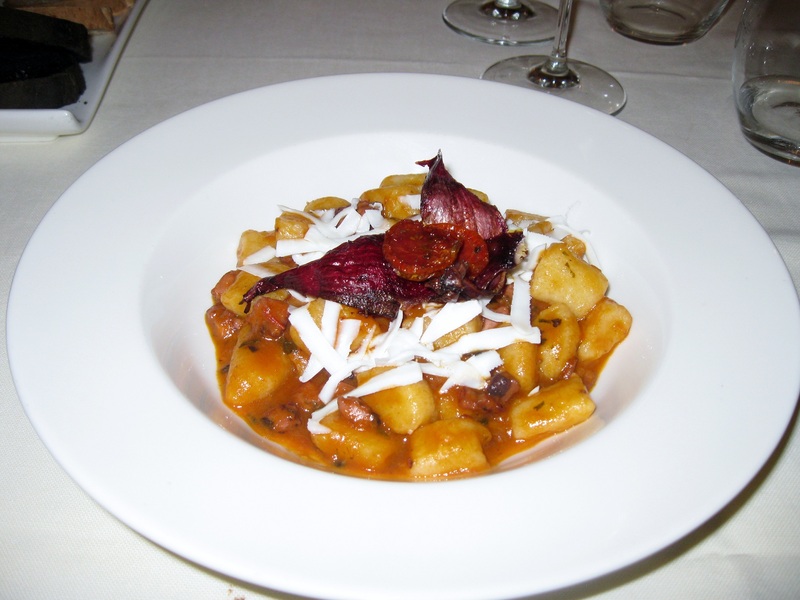 Potato gnocchi with octopus ragout and smoked ricotta. Who said cheese and seafood couldn’t be paired? 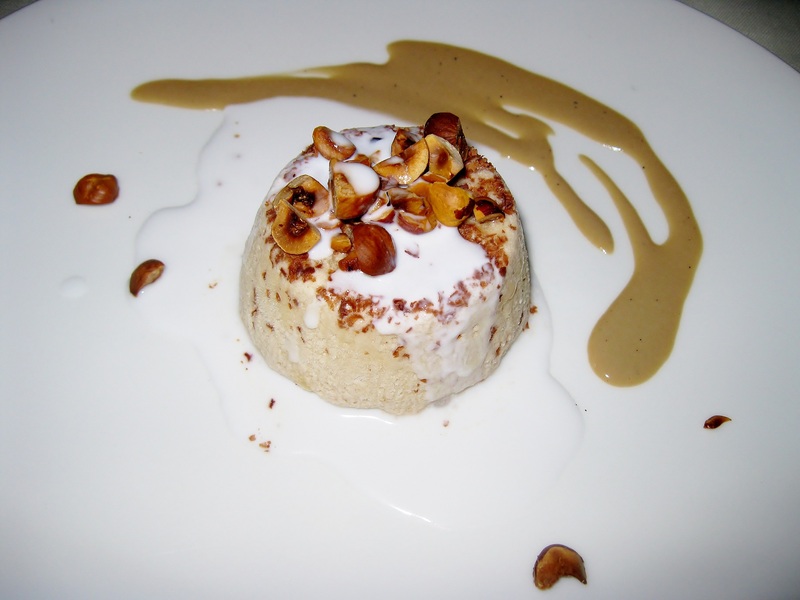 Langhe’s Hazelnut semifreddo with coconut milk. Langhe, a sub region of Piemonte, is famous for its wine production, but it is also known for the fine quality of its hazelnuts. In Italy, when hazelnut is paired with chocolate, it becomes Gianduja. If hazelnut is paired with coconut milk, it becomes ecstasy (seriously!). 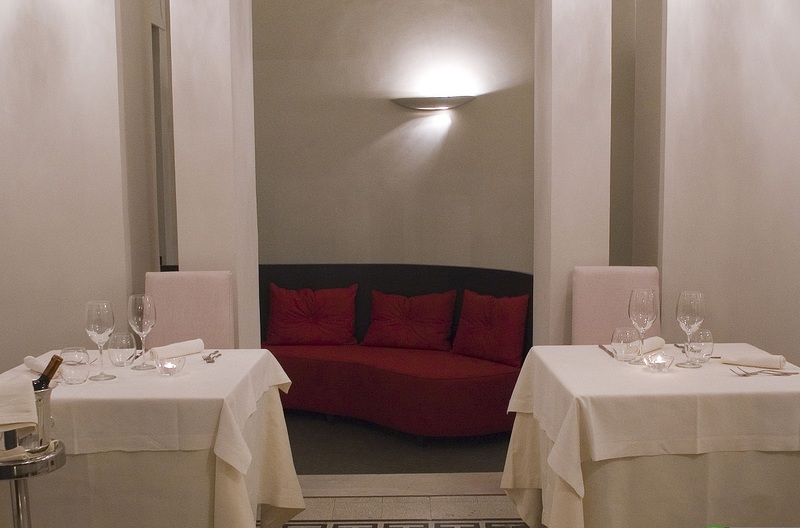 The mind behind all these magnificent dishes is the talented chef Alessandro Moser, who gently approached our table and asked about our dining experience. Silence…….Nevermind……..I was already in Nirvana. Nirvana indeed! The tartare is stunning, so is everything else. Great review. And believe me, we paid nothing compared to the quality of food. Excluding wine, we payed around 30.00 euros per person. senses are in for a treat and each one is challenged and excited for the experience…food delivered with heartand truth…what can be better! Keep the the great work Mario …you and your staff are winners! Take care Dr.
Mario is such a great host!